The JMRI DS64 Configuration tool lets you configure the internal options of a Digitrax DS64 Stationary Decoder directly from your computer running JMRI. To open this tool select "Configure DS64" from the LocoNet menu for the connection this DS64 is attached to. Each DS64 present on LocoNet is identified uniquely by its "Board ID". This tool may access a particular DS64 by entering the Board ID number in the selection box at the top of the window. Upon start-up, this tool queries LocoNet to create a list of DS64s. Each DS64 Board Id is listed in the pull-down selector. New Board Id numbers may be typed into the box and will be added to the list. The basic operations are configured on the "Basic Settings" tab. This tab gives human-readable descriptions of the various options. Changes made here are immediately reflected on the "OpSw Values" tab, but are not written to the addressed DS64 until the "Write full sheet" button is pressed. The "Read full Sheet" button may be used to read the OpSw settings from the DS64. The "OpSw Values" tab displays the individual "OpSw" settings which correspond to the settings found on the "Basic Settings" tab. Changes made on this tab will immediately reflected on the "Basic Settings" tab. The "Read full Sheet" pushbutton may be used to read the OpSws from the addressed DS64. The "Write Full Sheet" pushbutton may be used to write the OpSw values to the addressed DS64. The "Output Addresses" tab allows reading and writing the DS64 output addresses. The addresses need not be sequential. The "Read full Sheet" pushbutton may be used to read the Output addresses from the addressed DS64. The "Write Full Sheet" pushbutton may be used to write the Output addresses to the addressed DS64. Each DS64 may be programmed to hold up to 8 "Routes". Each route consists of a "Top" (or "trigger") switch command, plus up to seven additional switch commands. When the "Top" ("trigger") switch command is seen by the DS64 on LocoNet, the DS64 will send the other switch commands to LocoNet. When the proper OpSw settings are made, the DS64 A* and S* input signals may each be used to trigger one of the programmed routes. This tool allows configuring each of the 8 "Routes" via the "Routes" tab. Once the "Routes" tab is selected, an individual "Route" is selected on the left side by selecting one of the tabs. Within each individual Route, the "Top" turnout command is the command which begins the sequence. 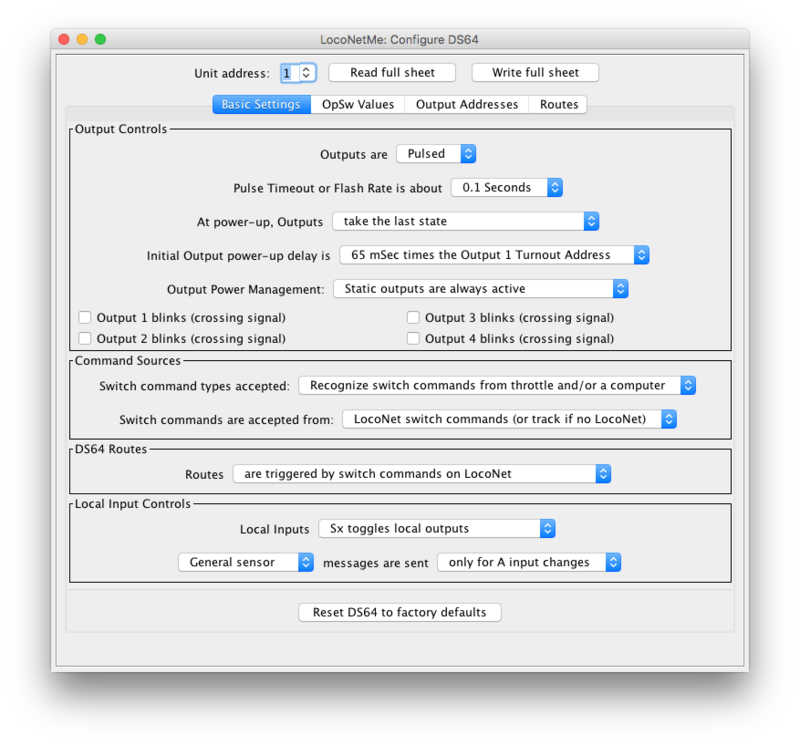 The received LocoNet command must match the "Top" turnout command exactly - both in address and direction, in order to trigger the route via a LocoNet command. Once triggered, the DS64 will transmit the subsequent turnout messages to LocoNet, until it finds an entry marked as "unused", or until it has sent the 8th entry, which ever comes first. When a DS64 input is used to trigger the route, and the route has a "Top" entry which is something other than "Unused", the DS64 will transmit (on LocoNet) the "Top" switch command, as well as any subsequent commands, until the 8th entry of the route has been sent or until it reaches an entry marked as "Unused", whichever happens first. If the topmost entry of a route is marked as "unused", the whole route is considered invalid. Note that it is not necessary to enter a duplicate turnout command to terminate the route before the end of the list. Simply configure a turnout as "Unused" to terminate the route. For example, if there are five turnouts in the route, including the top-most turnout, then set the sixth turnout entry as "Unused". The DS64 will then ignore the sixth, seventh and eighth entries for the route. When the "Routes" tab has been selected, the tool provides an additional button for "clearing" the route. This button is found at the top of the window. When this button is pressed, the tool will ask for confirmation before making any changes to the DS64. Upon user confirmation, the tool updates the DS64 to clear the route which is selected. Only the selected route will be cleared; other routes remain unmodified. Because of the way the DS64 board works, this tool can't change the basic address of the unit. This tool does not have the capability to save the DS64 configuration. The "Output Addresses" tab shows the state of the output at the time that the "sheet" was last read from the DS64. This tool does not attempt to track any ongoing turnout control messages, so it cannot provide real-time updates of the DS64 output state. When a route is "cleared", the tool will simply update the DS64 with the information that the top-most entry is "Unused", and then clear the route display. The remaining information from the route remains un-modified in the DS64. It cannot be executed as a route. A "Read full sheet" operation, for the route, will display the remaining "orphaned" route information.